Pensacola bidders in the Airport concession contract dispute have invoked the “buy local” philosophy. It is bad news for City taxpayers and local businesses if City Council favors local bidders. Prices tend to be higher in communities that give preference to local bidders. Price becomes less of a factor in contract awards and negotiations. Taxpayers are the ultimate losers. Preference for local bidders can also be bad for local businesses. Other communities may retaliate. They may shy away from awarding contracts to firms in “local preference” cities. Suppose we become known to be prejudiced against outside firms. 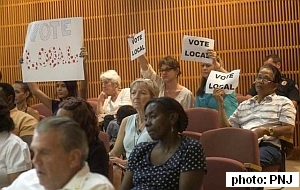 Then other communities may disfavor Pensacola vendors. The local bidder team is also using the silly tactic of organizing “buy local” rallies. This approach has become a staple in Council politics. Over the years, rallies have been organized in support of the Port of Pensacola, Community Maritime Park, Waterfront YMCA and now the airport concession contract. The participants get a pep talk, proceed to Council meetings and applaud at appropriate times. This is all “…sooooooo Pensacola”. This entry was posted in City of Pensacola, Pensacola Chamber of Commerce, Pensacola City Council, Uncategorized and tagged buy local, Community Maritime Park, Florida, Pensacola, Pensacola Airport, Pensacola News Journal, vote local. Bookmark the permalink.